A central London fuel bill assembly at the Department of Energy and Climate Change. – Symbols or examples of the things you’re doing without in order to heat your home. Supported by: All African Women’s Group, Climate Justice Collective, Disabled People Against Cuts, Frack Off (London), Global Women’s Strike, the Greater London Pensioners’ Association, National Pensioners’ Convention, Redbridge Pensioners’ Forum, Single Mothers’ Self Defence, Southwark Pensioners’ Action Group, WinVisible. Get in touch with us if your group would like to be listed as a supporter. Part of a national weekend of fuel bill assemblies and action called by Fuel Poverty Action. While one in four families choose between heating and eating, the government is plotting to increase our dependence on dirty and expensive gas power. This will send fuel bills even higher, contribute to rising food prices through climate change and block the alternative of cheaper, cleaner renewable energy. While disabled and elderly people are forced into libraries and shopping centres to keep warm and people with cancer freeze in their homes with the heating off, the government is slashing crucial benefits and cutting grants to make homes energy efficient. 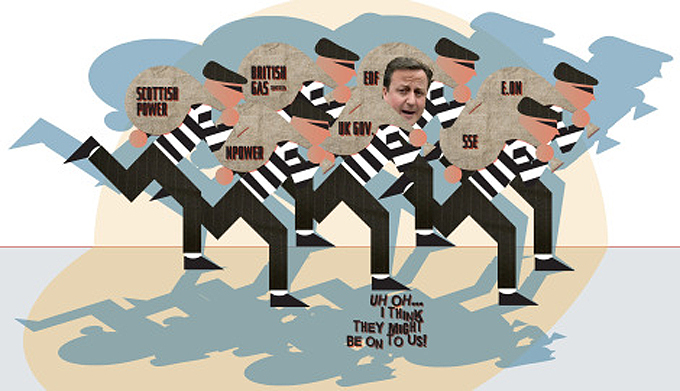 The government is snugly in bed with the Big Six energy companies. Dozens of Big Six energy company staff are being paid by the government to set energy policy within the Department for Energy and Climate Change. Together, they’re doing all they can to keep profiting from the Great Fuel Robbery. We say: enough is enough. Join us at the Department of Energy and Climate Change for a fuel bill assembly, as part of a national weekend of fuel bill assemblies and action. Come speak out about living with mammoth bills, debt, cuts and cold homes and share experiences of how you’re getting by. Come discuss how we can support each other. And come take action to Stop the Great Fuel Robbery. Afterwards, we’ll find somewhere warm to go together to keep on the conversation. This entry was posted on 31 January, 2013 in homepage and tagged Dept Energ and Climate Change, Fuel Bill Robbery, Fuel Poverty Action, Sat Feb 16. Bookmark the permalink.